The entries we received were so touching and raw. There are so many I just wanted to call and envelope in a hug. So many families are fighting for their lives, for their children. I heard the most terrible of situations – people are so strong. I really consider myself fortunate that just maybe when someone who desperately needs some happiness opens that box and sees the doll a smile will cross their face. As you can imagine, I got overwhelmed with emotion and wanted to spread more joy. We ended up finding another 10 dolls to give so the Blessing Doll’s got bumped to 30! I did get a little stressed over the costs mounting up around shipping and getting in some extra hands to dress, blush, do the hair and then ship all these gals – it’s a lot of work. I’m a small business and the dolls, well, I’ve already paid for them in materials and such so I don’t really think about it – it’s just sending the dolls where they need to go but the other stuff – oye – costs mount up! I don’t know why but it’s really hard for me to ask for help – I have a bit of a martyr complex (ask any of my close friends). I braved it and asked my community on Facebook to help and gosh did they EVER. To make it fun I gave each $5 donated a chance to win a Golden Ticket! Then anything over the shipping costs we’d put towards sending MORE dolls out to families that need it. I have to figure out what the shipping costs are with the actual postage and then boxes and some hired labour time but I think we are able to send out another 4 dolls on top of what we are sending out. Probably more – but this is a conservative estimate! Then another thing wonderful happened. A customer, with a very big heart, bought 4 dolls and donated them to the Blessing Fund as well! Incredible! I am so moved by this – isn’t that incredible?! So – I’m extending things a bit. I think to make it fair and out into the wider community (who may not be on Facebook) I’m going to take Blessing Doll nominations to put in with the other entries for the extra dolls that have become available. You have until Thursday night to email us at blessings@bamboletta.com. On Friday we will chose another 8 (at least) families to give dolls too. And, if you’d like to help out with shipping costs and to put towards a few more dolls – you can donate here! This whole thing feels bigger then just us at Bamboletta doing it – from the stories people are sharing to the donations people are giving – it all feels like wonderful warm fuzzy magic we are spreading around. Thank you, thank you for all those who have donated. I will accept donations until Sunday night around midnight – then on Monday we will draw a name. We are sorta old school about these ways. Allison wrote people’s names however many times they donated (so five times for 25) and put them on little individule pieces of paper – raffle style. They are currently sitting in my son’s top hat from Halloween. We’ll add new donations in there of course! I can’t tell you all how much I appreciate this. When you are part of this Bamboletta family you become part of something so much more – THANK YOU for loving and buying the dolls because it makes doing stuff like this possible. And acts of kindness and love like this have ripple effects beyond measure. And when you get a doll, or like our page you are part of this. Thank you, thank you, thank you! As many of you know, my family and I moved over to Vancouver a few months back. Well, before the summer actually – time has flown. The dolls are still made over on the Island by our lovely sewing mamas but the other side of stuff is now done over here. Where I used to have Brooke, Brandi and Makiko handling the uploads and shipping side of things while I sewed and did things like book keeping and staying on top of the business-y stuff – it’s now me. So, it’s been intense. And freaking awesome. And quiet with a lot of thinking. I feel like I’ve gone back to when it was just me a dozen or so years ago but with all the knowledge of what I’ve learned and the vision of what I want things to look like moving forward. Bamboletta really feels like it’s own thing, it’s own entity that has moments of growth and then hunkers down with some tea and stays put for a while. It’s seasonal and has it’s own flow. Right now, I’m hunkering and it feels like I’ll be like this until spring. I want things to settle, connect into the incredibly talented and fantastic maker community here in Vancouver and see where things go. 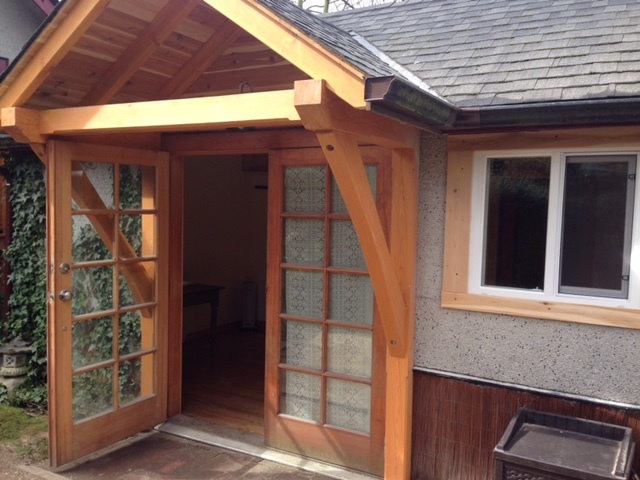 I looked at a studio this week that is absolute perfection and , wouldn’t you know it, is available in the Spring. This is what I’m thinking in terms of the future. I thought my home studio may work as an ‘open to public’ space once in a while but that doesn’t feel right. Anyhow, a space for a little retail, a little workshop here and there – I have so many SO many ideas but for now I’m enjoying this hunker time and I’m marinating in my dreams for the future – this is my idea of business planning. So, until then – no Granville Island Public Markets. I really tried to make this work but the 10 hour intense retail hours market days (tourists ALL day) are too much for me to take on along with my current work schedule and my family. Clothing uploads will be coming more frequently. I’m in the process of hiring on a few new people here to do some clothing and have reorganized things with my current seamstresses over on the Island. So, the hope is to have more things on the site soon! And those Forever Friends! My heart is so taken by these dolls. Something about the length of them (about 20″) and their lankiness is sweet to hug and cuddle. The clothing has been made by my friend Melissa who’s been mixing vintage fabrics, linens, tea stained laces and general fabric deliciousness to create these one of a kind outfits. 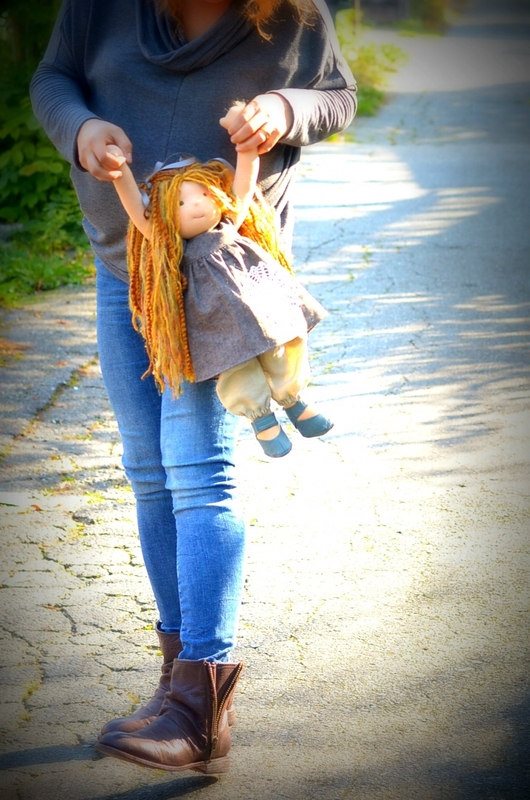 She has an incredible sense of style and I can see it translated into the dolls. But, most fav part of the dolls is the little pocket in the back of the body. I’ve been slipping some quartz hearts and love notes in them before I send them off. Details like this make me swoon! And, kits! I do plan on re releasing them back into the fold eventually. It’s something I want to move over here to Vancouver so I need to have things in place here for that to work – so many pieces and people to organize for things to click along. Heads, noses, hair, bodies, fulfillment – so many bits to put together. It’s been nice ‘chatting’, Friday evening with a mug of tea and good music blogging? This is luxury! Thank you for reading! Everything will come together perfectly. Love and miss you C! I think your plan of hunkering down, especially with the colder seasons among us and your new move is a fine idea. Find your space and time with family and things will fall in place! Sounds like a new studio in the Spring will be a great new beginning after a nice hunkering. You and your ladies make many sacrifices to get us beautiful dolls and we Truely appreciate all that you all do!! So many of us are mothers as well, and we totally understand the juggling of life! I am looking forward to being in for the long ride with you and Bamboletta. I am glad things are getting back to normal for you, Ha whatever Normal is. I was getting hubby talked into a trip to Granville someday but I guess not now. I really wanted a Piccolina. Is there anywhere else you will be selling these sweet little ones? I had all these pics done after our award last year – I think this one was for the Small Business BC website. This is my mom’s doll. I put something up on Facebook last week that as of July 1st we will be increasing our prices. Although many people saw this, I wanted to make sure that this message reaches as many people as possible – hence the blog post. So, a price increase will happen on July 1st. With rising costs of wool, yarns (I’m finding better and better ones to use – have you seen the hair lately!) and fabrics – I’m barely making it. Not to mention the 10 or so hours of mama love that goes into each doll. I made a mistake back in February when I changed my pricing from US to CAD without adjusting the price. I didn’t realize how much I depended on that exchange to ,well, give me an income and pay for things that come up like insurance (13k PER YEAR! – isn’t that crazy?) and the government (oh the sweet CRA always wants a big huge piece of the pie). Business is not my forte (and thankfully so because if I was I’d never be in business – this whole gig is a big, huge act of faith and devotion) and I am an optimistic – thinking once I didn’t have the studio or employee costs it would work out. I’m not swimming in pools of gold over here, haha, we live super modestly and it’s so that I can run the business with the ethics and values that I hold near and dear. I’ve discovered what is ‘enough’ in life and my heart is full – but I have to be able to pay my suppliers and not have the CRA call me because I’m late for a payment. Again. I just looked on my blog and the last time I raised my prices was on March 1, 2012. Three years ago and I raised them to $250USD as the price for dolls with fairy bits (it’s now $240 CAD – $194 USD). I dislike doing this sort of thing and should have raised my prices since then but I totally get sick around this sort of thing. But now my hands are tied – I have to. Like there won’t a Bamboletta if I keep prices at this rate. As of July 1st, 2015 my prices will increase by 15%. They will still be in CAD funds and therefore be lower then what they were back in January. The doll kits will stay the same as will the clothing – but the dolls, they will go up. I have so much gratitude in my heart for all of you who love our dolls – thank you so much for all your support over the years. Like I mentioned earlier, I posted this on Facebook and had my heart blown open by the comments and support you all showed. Bamboletta ,to me, represents a world of business I want to happen, the one that puts so much love into it’s product and cares deeply about how it’s made and by who. This is an intrinsic quality that is hard to put a dollar value on but is definitely passed onto the receiver of the product. Thank you for valuing what we do. I am so glad you put this information on the blog, as well as Facebook. It is important to me as a customer, that you and Bamboletta are doing well. My husband is the sole owner of an electrical business and it is critical to us, his parents (who started the business) and all of his employees, that he is being paid. Not only barely enough, but enough to be able to continue to improve, pay all the taxes, fees etc. and provide a living-wage for his employees. Throughout the years of his work, he has increased the number of employees from 2-3 to 40-50. With increase in the number and size of the jobs he bids and the service work that is accomplished, many and sizable expenses are incurred. I continue to be thankful for all he does, for not only our family, but his employees and their families. It is important to share work, and provide opportunities for others, if one is capable and works to provide these opportunities. Thank you for all the the work, time, thinking, energy and love that you provide with your dolls. I am glad and willing to continue to purchase these dolls. I have been gifted with the opportunity to provide these precious dolls with several different groups, in addition to my enjoyment. May you continue to provide wonderful dolls and joyful play for children for many years. God Bless. So sweet of you to explain this, but the truth is you do whatever you have to, to keep this sweet company alive! The world needs more like you it would be an awful shame to ever lose it. We only have one of your dolls but she is get treasured, we have a two girls two years old and an 8 months old so we plan on more in the future! I totally understand Christina! We have the same issue with our playsilks. We pay our workers a fair wage, and we have to pay ourselves some too! Not much, but like you, I believe in our work and love doing it. We raised prices this year and it is hard to do. Best to you!! Thank you for the explanation, but those of us who love your work will continue to love and purchase it. You need to live, and to grow– money helps that happen. On a side note, while I was doing B-school this spring, Bamboletta was one of my companies that I focused on. Branding, ethics, customer relationships, social media– you rock it all! Thank you to being an inspiration to other small business owners. You raising your prices just gives me one more reason to look up to you. It’s not easy to charge what you’re worth, but when you do, you bring every one up with you. I’ve put the word out (to the universe, mainly) that I’m looking for a little studio here in Vancouver. 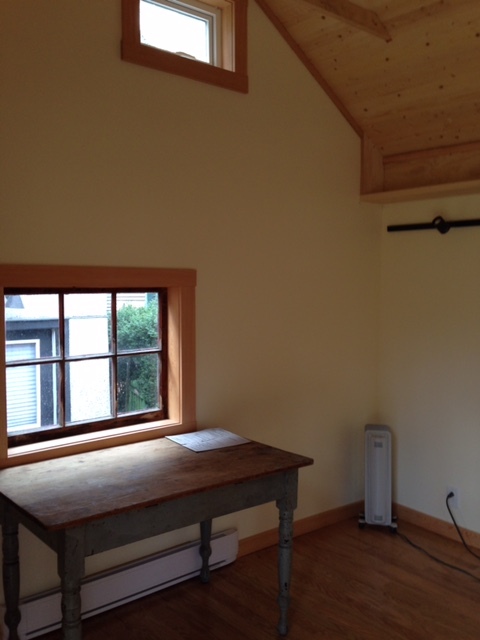 What I need is really tiny compared with the 2500 square feet we had before. Now that production is mainly on Vancouver Island, Audrey and Jes house most of the materials (like 250lbs of wool a month) at their home studios. It’s pretty cool how it’s all worked out. I need a place to sew quietly, do doll hair and dress them and do stuff like shipping, photos, paperwork. My first priority was to settle down here into a new rhythm and see how my week looks like as compared to when we all worked together. Well, I saw an ad on Craigslist. 4 hours old. 4 bedroom character place off Commercial Drive (super sa-weet neighborhood I grew up in) that, get this, has a studio in the back. What?!? Did I put in a cosmic order for this or what? I quickly emailed knowing for sure this place was mine and the lovely owner told me that there were already 2 families ahead of me looking at it. No problem – I just knew this was my place. So I gently emailed the owner again laying it all out there. The area. The house. 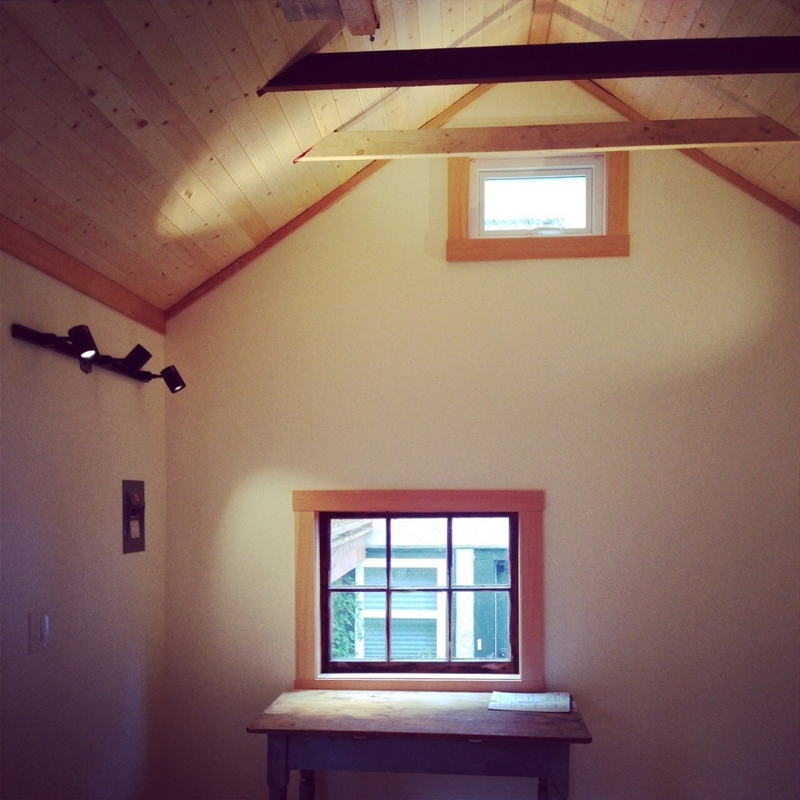 The STUDIO. That I can have Acorn my dog there (but not in the studio around the dolls). Well, as you can guess by my blog title – I GOT THE PLACE! We’ve owned homes for the past 15 years or so, so the elation of getting the place you wanted as a rental was pretty sweet. 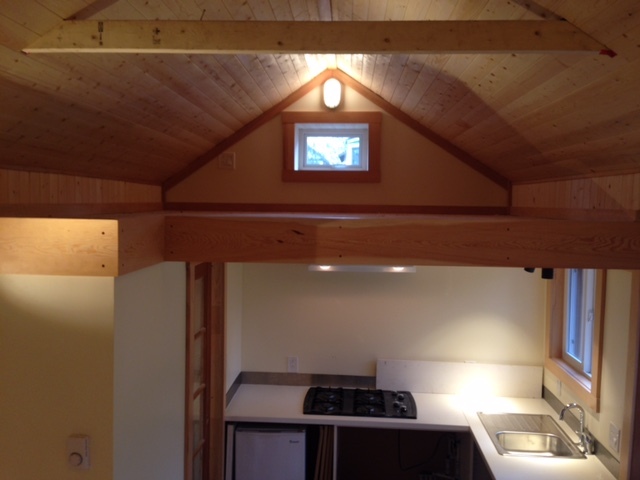 It feels nice to not have to worry about the roof, or the hot water tank or anything like that on a place. Especially since we already have our Cobble Hill home to look after (until John finishes school – then we sell). And the inside .. maybe I’ll do classes in here! August 1st is my move in date. Until then, I am in this pretty tiny 2 bedroom apartment with dolls everywhere. It’s good right now, but I’m a bit nervous for space once the boys come here when they finish school. I predict lots of time at Nonna’s ;). I feel like jumping up and down too! For you!! You deserve all the wonderful things that happen to you, because you sowed the seeds. Whatever you want to call it…luck, karma, God, the universe…YOU do great things…so your rewards shall be great. Congratulations! Hurrah! I just knew your place would find you 🙂 (Your story is SO much like when we bought the house we are in now….so thrilled for you!!) And the bonus of not having to juggle owning two homes at the same time will be well worth it. Your studio looks wonderful and just the perfect set up for you. Congratulations! I love how there’s a place for me and the little one! Love you to pieces ladycakes! Did you say classes? I live in Chilliwack, but would make the trek out to learn from you. 🙂 Love your studio. How blessed you are. I am sure you miss the Island sometimes though. Beautiful image by Erin Wallis Photography. I was asked recently by a friend as to why I started making the dolls and why I didn’t make those cute monster dolls or stuffed animals. Surely, I could make those too – she suggested as a way to expand my product line. But, I make dolls, it’s what I do. I love the idea of pouring my heart into one thing. 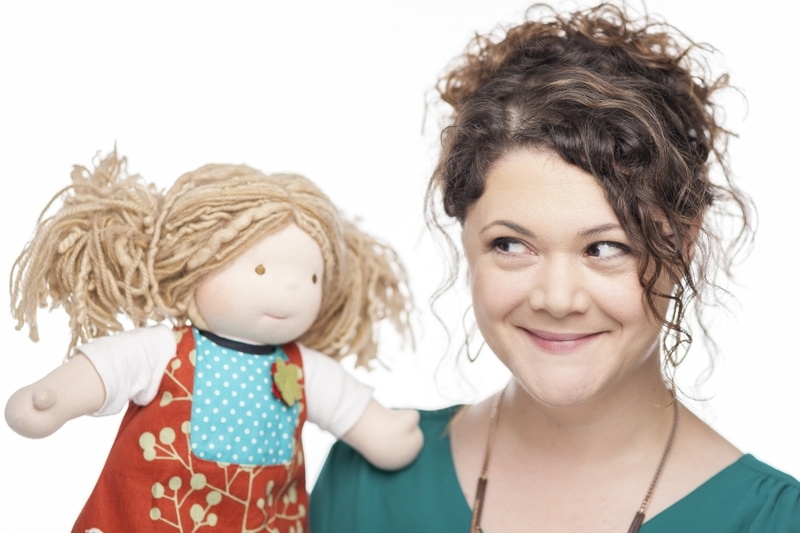 When I first started reading about ‘Waldorf Dolls’ (this is the philosophy upon which the dolls are based on) I was drawn in by thoughts of a simple expression on the doll, so that it can be used in open ended play – happy or sad or somewhere in between. And by the use of all natural materials because a child’s energy ‘flows’ better with something natural. I loved these concepts, they just made so much sense to me. Thing was, I wasn’t too keen on what was available at the time. I knew that the little girls in my life would want something a little brighter, happier and fun. So, I took my love of color, fabrics, and yarns (yum!) and created a doll. Then another. And another. 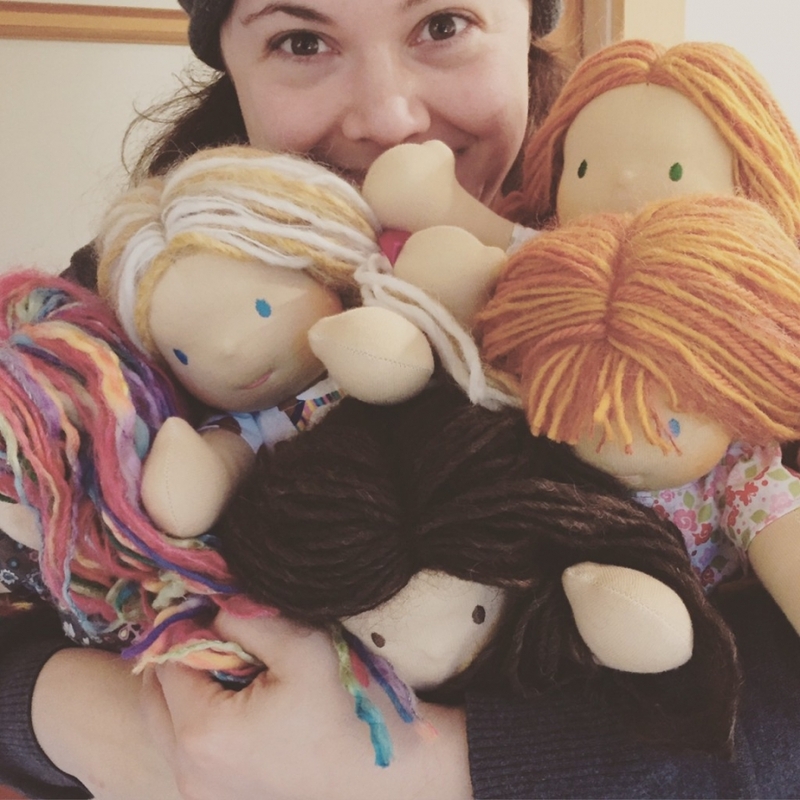 As I started making more dolls, I took them to a Waldorf school very excited about sharing what I did. 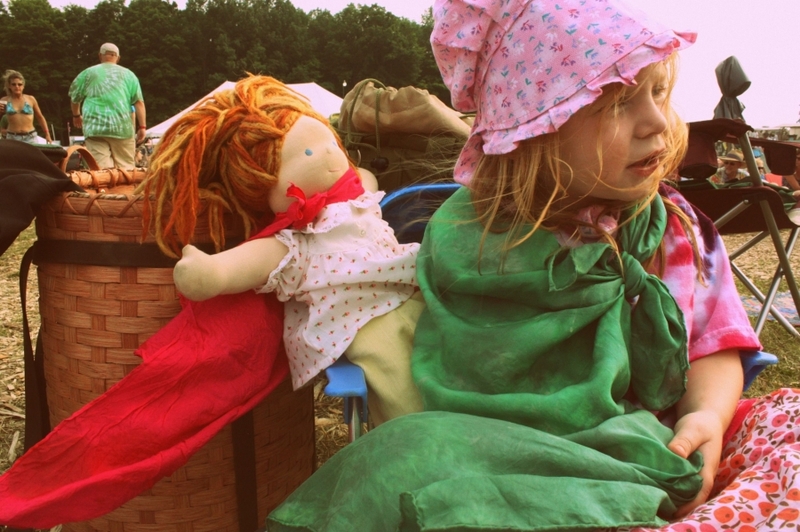 While the parents and most teachers embraced what I did and loved the more modern direction I was taking the dolls. There was one teacher who was very unkind to me – my dolls were ‘too happy’ and ‘too colorful’ and I shouldn’t sell them at the school. It was brutal – it’s like that lady was a vacuum that sucked up all the positivity from the day. 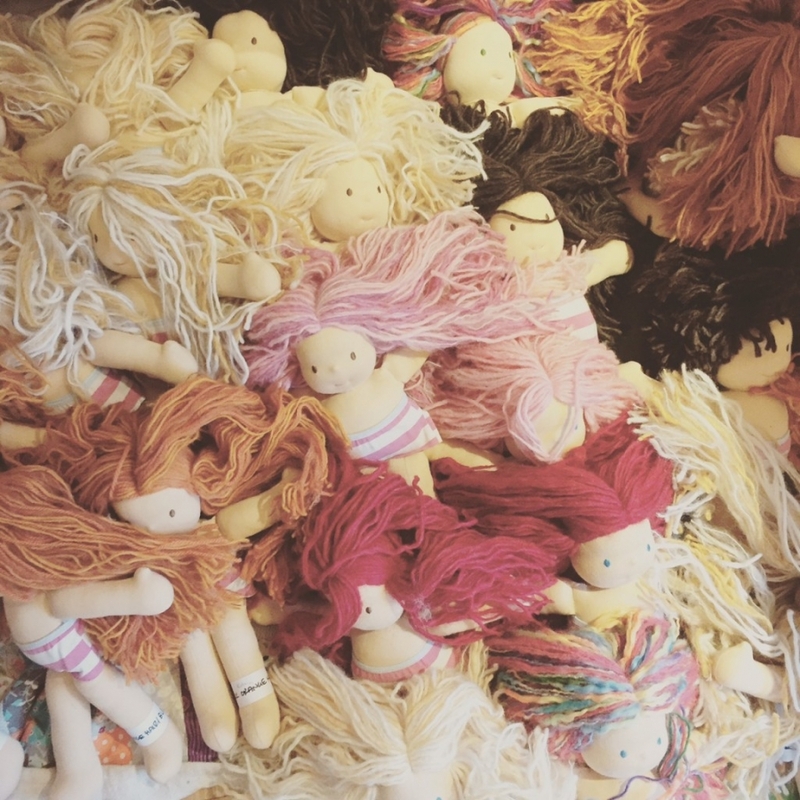 One part of me could have shrunk away and never make dolls again or start making them in the uber traditional way – taking her words to heart. The other part, the one that I listened too, just knew that this was what I was meant to do. You see, back then, Etsy didn’t even exist – and when it did it was only myself and a very few ladies making Waldorf Dolls on there. No one had seen what I was doing. 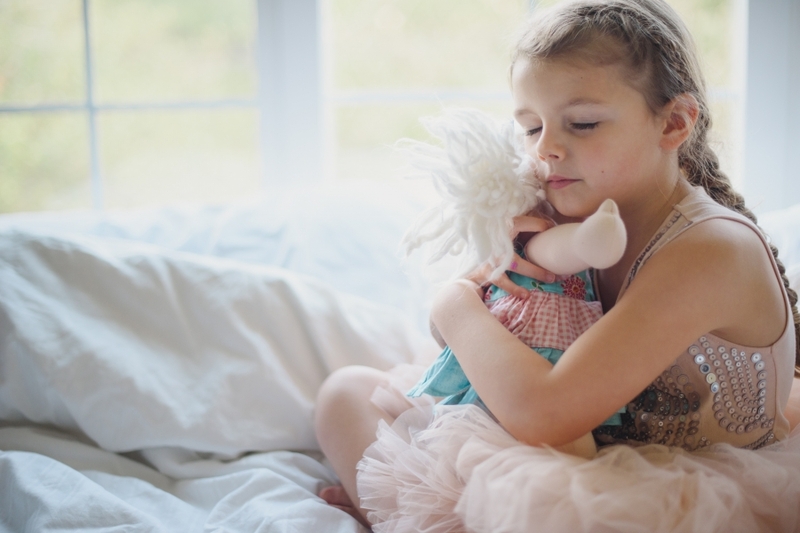 I knew that I could take the heart and concepts of this beautiful philosophy around dolls and bring it to today’s little girls. And not ones that are going to the Waldorf schools, necessarily. I knew I could bring them to my friends, my family, my community – a wider base of people. The concepts that first inspired and drew me in still hold steady in my work. They are the anchor in all that I do, my foundation. The simple faces that can convey so much and be what the child’s imagination needs. The hair made with so much thought. Our hair can be styled and played with (something I know I LOVED as a child – here’s our YouTube channel with different hair styling videos). I really remember as a child getting lost in textures remembering this is why I love combining different types of yarns to create it – we even go as far as hand dying most of our yarns to get all the shades we want. The simple bodies made much like a child’s – not a thin, unrealistic proportion. My dolls keep kid’s little – I can’t get started on how sick I feel when I see what is available to young girls today (another blog post). Clothing that can be taken on and off with velcro – easy. Every single thing we do is thought out using those basic tenants of the Waldorf philosophy but always with the question ‘what would the child love?’. Even while choosing fabrics I have this question near and dear to my heart. I make companions, secret keepers, a child’s little ally for that short period of time of their life. My doll was SO important to me growing up – the security and comfort I took in having her around is something I feel even to this day. I know I’ve said this again and again, but remembering that makes me feel so incredibly honored to be making dolls for your little ones today. Thanks Christina. We love your heart and your dolls. You are a gift. Personal reflection leads to growth and prosperity. It’s something we learn as we experience life. I thoroughly enjoy reading your blogs. They are inspirational and remind us all to remember to treasure our Littles so they may treasure their Littles one day. <3 So lovely! Christina, Yes, exactly what Nicole Downs said -“We love your heart and your dolls. You are a gift.” The sweet and dear Bambolettas are perfectly wonderful and magical — unique and special more than words can express. Your heartful and loving vision brings them to life and sends enchanted blessings out into the world. Thank goodness that you did not listen to whoever it was at the Waldorf school that said those ridiculously judgmental and hurtful comments to you. Lots of love to you. Thank you for sharing your special gift with us! Your dolls are special, like none other. You are a unique artist that is giving us something so special. Love, love, love your dolls!! Lovely blog post. Thank you for pressing on with your beautiful work! How can anything be to happy or colourful? Ridiculous. I’ve just discovered Waldorf style dolls, now that I have a daughter and have been looking for dolls that are made of natural materials. I love how yours are natural and handmade – but also have beautiful colourful hair you don’t see anywhere else. And the cute outfits! Love! Lovely blog post. Thank you for pressing on with your beautiful work! How can anything be to happy or colourful? Ridiculous. I’ve just discovered Waldorf style dolls, now that I have a daughter I have been looking for dolls that are made of natural materials. I love how yours are natural and handmade – but also have beautiful colourful hair you don’t see anywhere else. And the cute outfits! Love! I still remember my doll I had as a child. 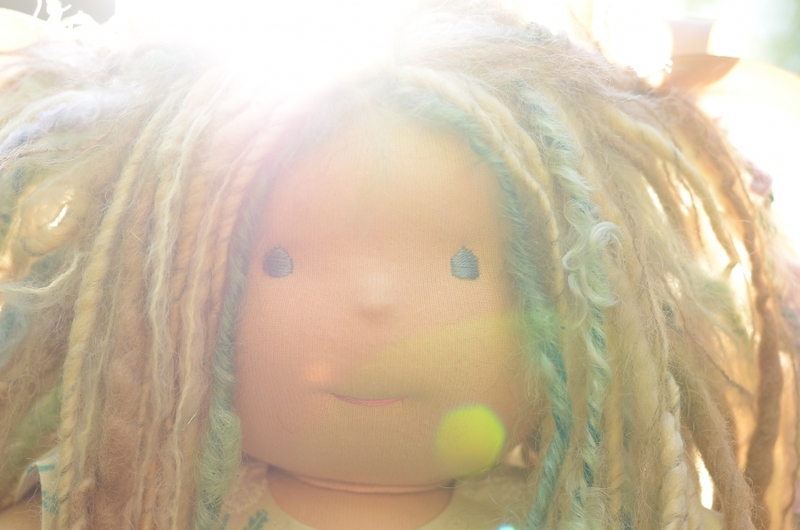 A cabbage patch doll with long yarn hair. I can still remember what it felt like to run my fingers through it. I remember her little fingers and toes…and belly button! Memories of what we played with as kids are powerful. You’re helping create them.